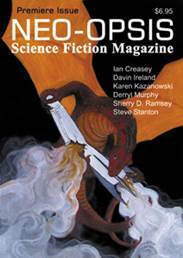 The premiere issue of Neo-opsis Science Fiction Magazine is 8” by 5 ½” and 80 pages of fun! Published October 10, 2003. Artist Stephanie Ann Johanson designed the cover, a dynamic mixture of science fiction and fantasy, depicting a dragon tearing apart a missile. Stephanie is artist, assistant editor and art director of Neo-opsis Science Fiction Magazine. She has also illustrated several of the stories in this issue. Following the editorial, Karl Johanson takes us for “A Walk Through the Periodic Chart”, which will be a regular column in Neo-opsis Science Fiction Magazine. In this issue Karl introduces us to “Neodymium”, and its many uses. Karen Kazanowski adds her two cents to Karl’s romp through the uses of Neodymium, with a wonderful illustration of the effects of ferrofluid on carpet. The first story, in Neo-opsis Science Fiction Magazine issue one, is “On the Road with Fiamong’s Rule”, written by Sherry D. Ramsey. (8700 words - Novelette) I don’t want to give away the whole story, so I’ll just say that it is housewife meets adventure, science fiction style. Sherry D. Ramsey is a Canadian science fiction and fantasy writer whose work has appeared in print, online, and over the airwaves. She lives in Nova Scotia with her husband, daughter, son and various pets. You can visit her on the web at www.sherrydramsey.com. The second story, “Successful Delegation” by Ian Creasey (4,000 words - Short Story), explores the diplomatic meeting of first contact with life on a gas giant. Ian Creasey was born in 1969 and lives in Yorkshire, England. He began writing when rock & roll stardom failed to return his calls. His fiction has appeared in various publications including Oceans of the Mind, Gothic.Net, Paradox, On Spec, and Challenging Destiny. The fourth story, “Closet Business” by Davin Ireland (4,090 words - Short Story), tells a story worthy of The Twilight Zone. Step into the store and have a close look at what is on the shelves… An Englishman by birth, Davin Ireland grew up on the Hampshire town of Basingstoke before moving to the Netherlands, where he has lived for the past fourteen years. His stories have recently been accepted by a number of print magazines, including Here & Now, JupiterSF, Dark Animus, Underworlds, and The Journal of Pulse-Pounding Narratives. The fifth story, “Timestealer” by Steven Stanton (1,670 words - Short Story), well gee… if I say anything I will give the story away. Read it… I think you’ll like it. Steve Stanton is the editor and publisher of “Dreams & Visions” magazine. He recently published a science fiction and fantasy anthology, “Sky Songs”. He also has two science fiction novels in print. Two informative book reviews by Paula Johanson, give us the skinny on “The Nitpicker’s Guide for X-Philes” by Phil Farrand, Dell Publishing and “The Demon in the Freezer” by Richard Preston, Random House. Paula Johanson has been a free-lance writer for 18 years. Two of her stories were short listed for Aurora Awards. She has written book reviews, articles, and poetry for a number of magazines, newspapers, guidebooks and fanzines. She teaches writers’ workshops for community colleges and libraries, and writes d20 material for RPG companies. Paula has been working with Tesseract Books for five years, currently as assistant editor in acquisitions. Karl Johanson treats us to his Maynard and The Cheese cartoon, a commentary on one-upmanship. Neo-opsis Science Fiction Magazine lists the winners of the 2003 Hugo Awards and the 2003 Prix Aurora Awards. Karl Johanson created a collage of pictures from the 61st World Science Fiction Convention held in Toronto Ontario, Canada, August 28 to September 1, 2003.